When Goshen, Monroe, and Newburgh drivers hit the gas in the 2017 Honda Accord, they can count on a fusion of high-end power and stunning mpg ratings. That’s the case no matter which of the Accord’s three power options you end up deciding upon; here’s a quick rundown of how each one performs — and the stunning 2017 Honda Accord mpg ratings with each. LX, EX, and EX-L trim levels of the 2017 Honda Accord all receive up to 185 horsepower and 181 lb-ft of torque from the 2.4L four-cylinder engine. That’s one of the most impressive standard outputs around, easily outpacing rivals like the 2017 Ford Fusion, 2017 Toyota Camry, and 2017 Mazda6. Efficiency is also top-notch, and there are two transmissions to choose from. Expect up to a healthy 23 mpg in the city and 32 mpg on the highway* with 6-speed manual or an even more impressive 27 mpg city and 36 mpg highway* with Continuously Variable Transmission (CVT). For 2017, the Accord offers two Sport models, the regular Sport and the Sport Special Edition. Both of these performance-oriented trims come fitted with the same 2.4L engine you’ll find with the LX, EX, and EX-L, but a less restrictive dual-exhaust system boosts output to 189 hp and 182 lb-ft of torque. Thanks to a CVT, efficiency ratings remain impressive. In fact, you’ll be able to count on up to 26 mpg in the city and 34 mpg on the highway. * There are even available paddle shifters if you fancy manually raising or lowering the gear ratio. For the ardent driving purist, no engine option will do but the available V6. With up to 278 hp and 252 lb-ft of torque available for you to command, this is an ideal option for those Goshen, Newburgh, and Monroe drivers who want to combine the practicality of a midsize sedan with the performance of a roadster. The 2017 Honda Accord mpg ratings break the mold by combining stunning efficiency with exhilarating performance. 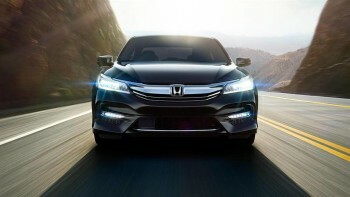 To find out more or arrange a test drive, just contact Middletown Honda today.